Love is pure. At the same time, expressions of love can vary from person to person, or from one relationship to another. Are we ready to accept love the way it comes to us, or we have some preconceived notions of how love should be? "Why are you crying Sneha?" asked Priya, her mom. "Papa shouted at me.." uttered a sobbing Sneha. "And why did he shout at you?" "Just because my books were not kept at the right place and were lying around on the sofa. I do not like him..he shouts." and Sneha started sobbing even harder. Considering the sensitivity of the situation, Priya came and sat next to Sneha, let her keep the head in her lap, wiped off her tears with her hands which deftly loved across Sneha's face, cajoled her hair multiple times till her sobs diminished. "Thats his love for you, Sneha. When a father shouts at you, thats his way to express his love for you. When your stomach is upset and I dont give you food for the entire day, thats my love for you. When either of us shout at you in the morning if you are not waking up, thats our love for you. We wake up before you, though we also want to sleep for another few extra minutes, just like you. Thats because of our love for you, he is happy with 2 pairs of jeans and a few shirts and is ready to buy a new dress every month, thats his love for you." Sneha was listening, though not reacting. It seemed as if she was absorbing. "You know yesterday, while driving through the market, on the road side, we saw three children on the pavement, fighting with each other. We had no idea if they had their parents or they were abandoned children of god. They were fighting for food. We, as you know, always keep some clothes in our car, to give to the needy. So, we offered a small frock to the girl - who was one among the three fighting for food. You know what happened after that?" "Before we could react, all 3 pounced on the skirt and started snatching it from the other. The food, for which they had been fighting just a few seconds back, was forgotten for the moment, till the ongoing tussle on the dress was resolved. Sneha, you do not experience all these struggles because your basic needs have been taken care of - by your Dad and all of us. He works for you, day in, day out. Thats his love for you." "And then when he scolds you for not keeping the books in place, he is only expressing his love for you because he understands the importance of keeping things back in their place - a small yet powerful tool to great success. He wants success for you. He loves you. Dont cry now, c'mon get up. Be a good girl." Sneha perhaps understood it. She smiled and walked to the other room where she overheard her Dad to talking to her grandad. Sneha's grandfather was an old man - in his 90s, but very lovable. "Dad, I don't know whether I will cry when you die, but one thing is very sure that i will not let you cry as long as you are alive." said Sneha's Dad to her grandfather. Sneha cried again, this time, it was the purity of love for her dad which made her cry. She was proud to have a Dad who loved her. She realised she was so much more privileged than so many others others who don't even have a dad to take care of their basic needs. She ran out of the room towards the room where her Dad was sitting. She ran hard. She ran as of she was running for her life. She jumped in her dad's lap to hug him, tight !! Her dad was surprised. "Nothing much, thank you for being you Dad. I just realised that love comes in so many different forms." 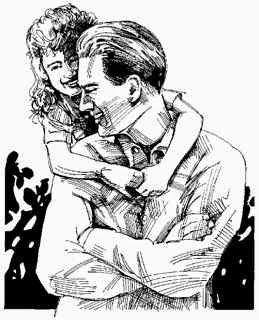 Her Dad would never know the reason for such an intimate hug, but Sneha had just understood that her dad's way of expressing love may not be the same as she expects love to be, but in every scold, in every thrashing, in every advice, in every hug, there is pure love that embraces her. Love does come in different forms. In exactly the same way, God loves us, though may express the same in different expected and unexpected forms. Sometimes, we may like HIS way of expression, while sometimes, we may feel that HE is being too harsh on us. But thats just his way of taking care of us, of loving us. If we just understand this simple concept that he is always there to love us and take care of us, Happiness can never be lost. We just need to be ready to accept and let HIM love the way he wants to love us. Let him love the way HE wants. In all ways, in all situations, we must understand that HE is there, with us, always ! !